Anarkali suits are and have been one of the most coveted ethnic outfits since the Mughal Era. The long flowing attire fitted at the bust has been modified over the years to match the trends. The word “Anarkali” literally means “bud of the pomegranate tree”. The etymology of the term Anarkali is as fascinating as the ensemble itself. Legend has it that Anarkali, also known as Nadir Begum, was a beautiful courtesan in the fort of Emperor Akbar. He was enamored by her splendor and she was his fondest concubine. She was murdered at his orders when Akbar condemned her affair with his son Prince Salim. They say she was buried alive between two walls in Lahore, Pakistan. Prince Salim, later known as Jahangir, when enthroned, erected a tomb in her loving memory. The words “Could I behold the face of my beloved once more, I would thank God until the day of resurrection.” adorn the magnificent sepulcher situated in the midst of a pomegranate garden. The Anarkali regalia exemplify the beguiling traits of a woman. The fitted bust exudes confidence and poise while the flowing frock emanates her exuberant nature. This is usually paired with tight fitted leggings and a dupatta easily available online. The Anarkali designs are wide-ranging including Anarkali dresses, Anarkali Salwar Kameez and Anarkali Salwar Suit that one can buy online. Anarkali dresses are floor length Anarkalis that are paired with either chudidars or leggings. They come in different materials like georgette and net fabric which one can buy online at reasonable prices. One can shop online for Anarkalis of different styles including A-line Anarkali, Asymmetrical Anarkali, Heavy Pleated Anarkali and Front Slit Anarkali at cheap prices. The A-line Anarkali has a straight fall and has a smart yet feminine touch to it. They are best worn in patterns or plain vibrant colours that one can shop for online. The A-line ensemble is fit for women of all shapes and sizes. The Asymmetrical Anarkali is shorter at the front and longer at the back. It has a tail-like flair that is best paired with high heels and chudidars that also you can shop for online. The Asymmetrical Anarkalis usually have heavy embroidery at the bottom to accentuate the flair. The Heavy Pleated Anarkali is the one with lots of pleats in the frock. Their length can vary from knee length to below to knee to even floor length Anarkalis. 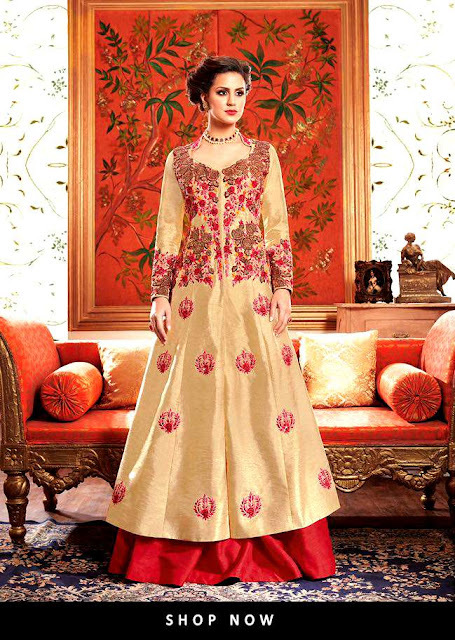 The floor length Anarkalis usually look like ethnic gowns that are popular this wedding season. You can shop online to get Anarkalis with golden shimmer to shine this wedding season. The Front Slit Anarkali is one which has a slit in the middle at the front. It is usually long and straight. The slit can start from anywhere under the bust to just below the belt area. The Front Slit Anarkali is trendy and perfect for girls who wish to show off a little of their belly. One can shop online at cheap prices for Front Slit Anarkalis paired with plazzos and pants. Assorted Anarkali styles are available online and can be paired with printed or straight plazzos, kameez or leggings. Short Anarkali Salwar Suit is best paired with a kameez as an Anarkali SalwarKameez. It is especially comfortable in the summer months but is available in cotton and wool fabrics all year long and one buy online. Anarkalis are one of the most elegant outfits of the Indian culture and make every woman feel royal and alluring. The feeling of being feminal is abound in every corner as you can now shop online for all styles, colors and cuts at reasonable prices. Go online and check out great deals on the most exquisite outfits! Be beautiful. LOOKING FORWARD TO EID SHOPPING? What to wear this Eid?